The Tom Harrison Map-Pack includes thirteen maps, all printed on durable plastic. A couple of weeks ago I reviewed the John Muir Trail Atlas, produced by Eric the Black. I used this booklet during my 2013 hike. On my first John Muir Trail thru-hike I used something different: a combination of the Tom Harrison Map Pack (designed specifically for the JMT) and a homemade supplement which I’ll describe later. The Tom Harrison maps are the most popular of the JMT navigation aids; they have a lot going for them. They are printed on some sort of plastic that seems, at first blush, to be rather fragile. It’s not. In fact, after 222 miles of folding, wadding and getting wet, (and another few years of storage in a hot, moist environment) mine are pretty much in the same condition as the day I bought them. The scale of the maps remains the same from sheet to sheet, and the red and highlighted trail stands out quite well. Why did I use something different this time around? First, I didn’t like the fact that the pages were loose. I really liked having the entire hike nicely packaged in a single, bound, atlas. That allowed me to look well ahead (or behind) during breaks, lunch and at campsites. It also gave me plenty of places to note times, the number of people I saw, and other data. More importantly, at least for me, was the lack of two pieces of information I wanted at my fingertips: GPS waypoints and elevation profiles. I used the NG TOPO software to create elevation profiles for each day of my hike. The profiles also depicted the waypoints I had established and downloaded onto my GPS. I added waypoints to my maps, and then entered them into my GPS. On the hike, I found that I used the maps rarely. The profiles were far more useful in telling me how far I had hiked that day, how far I had to go, and what sort of terrain was ahead of me. Since I could easily see what two waypoints I was between, I could quickly locate my position. I used the maps more to identify peaks and other terrain features. I didn’t use them for navigation more than two or three times. In all cases it was simply to confirm what I already decided at a trail junction. One important caution: saying that I didn’t use the map for navigation is NOT the same as saying I didn’t need one. I would never go on a wilderness hike without a map. It may not be essential when everything is going as planned, but it can be indispensable when the plan changes. Yep…sure have. The problem is that the Harrison maps have a fairly significant contour interval (80 feet). Also, for me at least, it’s just hard to beat a good elevation profile when imagining the ups and downs ahead. The Tom Harrison maps are terrific navigational tools. Starting with them, and then adding, if necessary, whatever additional data you require, is a great strategy. These maps are also really useful if you’re not jamming on through the trip. I’m going to take a month long, some what leisurely fly fishing trip and I want to see more of the country than a narrow/10+ mile a day obstacle. Factor in the llamas we’ll have along and we’re going to be camping in places less used…the maps are an asset to us having a terrific trip…in fact they were one of my first investments for the trip. Having more of the terrain around you graphically represented is definitely handy. Thanks for the comment, Jack! Ray, did you find any major differences in the map contents between the Harrison maps and the Black Atlas (mileages, waypoints, etc.)? I didn’t do a complete comparison, but they do differ here and there, and both (on occasion) differ from the Wenk mileages. So much depends on how you are measuring, I suppose. Thanks, Darren. What profiles are you referring to in this blog? I find the profile scale of The Atlas misleading due to the scale used, it makes the trail look relatively flat which it isn’t. The Harrison Maps does not contain a profile as part of the package either. I’ve downloaded and printed every profile picture I can find as well as the Guthook App and I also have Elizabeth Wenk’s book Kindle editions and your book on my phone. I don’t plan on carrying a GPS other than the phone and only plan on using the data on my phone in the evening to plan the next day. I may be having a data overload right now as I sort out the information and by the time I hit the trail all of this may be a moot point. I appreciate your sharing your experience with these resources it is nice to have a first hand perspective. Good day, Chip. Actually, it’s “Ray”. I do the blog. Tom does the map packs. The profiles I am referring to are ones I created myself using the National Geographic TOPO program. I found them far more accurate than the Blackwood Atlas profiles and very useful. It sounds like you’ve got everything covered, although I might be just a bit nervous about having everything electronic and not hard copy. Good luck! Great idea, Michel! You can buy waterproof paper for ink jet printers, too. I may have just what you’re looking for. 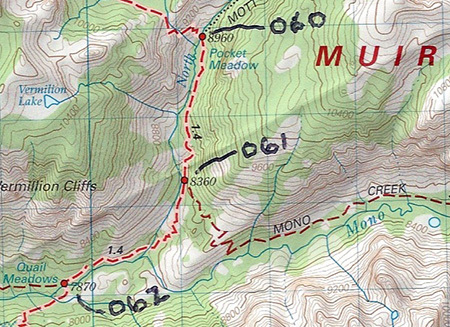 I’ve used the maps from antigravitygear.com for several section hikes on the AT, and to thru-hike the Smokys. They have major reference points, streams, shelters, camptsites, altitudes and resupply points, with a very nice end-t-end elevtion profile. 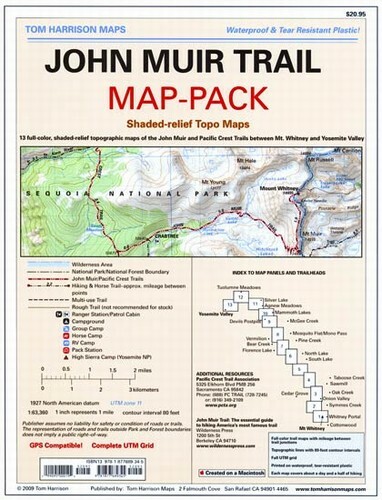 The JMT map weighs in at a grand total of 4 grams. The are plasticized, almost indestructable, and small enough to tri-fold and keep in my pants pocket for easy reference. Did I mention cheap? Thanks, Lane. This looks interesting. I may need to buy one and review it! Not sure what maps you mean, Martin, but here are several articles describing the alternatives: http://jmtbook.com/tag/maps/. Thanks for the quesion. this is great info. I already bought the Pocket Profile JMT/PCT Elevation Profile Map mentioned by Lane above. But, I am going to try and see the other maps too to decide on what I actually want to take. I think I am going to order one of those, too. Thanks for the comment, Pranitha!